Name your own price for MARCH, LOCKE & KEY, LoEG, and more with the IDW/Top Shelf Humble Bundle! Fans of digital comics rejoice! IDW Publishing and its imprint Top Shelf Productions have teamed up with Humble Bundle for an outstanding offer to download an outstanding library of graphic novels while at the same time providing books to kids in need. Running through June 10th, this bundle allows readers to name their own price for some of Top Shelf and IDW's greatest books of all time — including work by Alan Moore & Kevin O'Neill, Jeff Lemire, Joe Hill & Gabriel Rodriguez, Jess Fink, Darwyn Cooke, Mark Russell & Shannon Wheeler, Liz Prince, and Congressman John Lewis, Andrew Aydin, & Nate Powell! What's more, with each bundle, a portion of the funds (determined by each buyer) goes to support Traveling Stories, a nonprofit organization dedicated to "outsmarting poverty one book at a time." To take advantage of this incredible deal, visit Humble Bundle — claim yours before time runs out! Hunter S. Thompson's FEAR AND LOATHING IN LAS VEGAS (The Graphic Novel), Adapted by Troy Little! Marietta, GA (May 27, 2015) – Legendary journalist Hunter S. Thompson's genius was rooted in his ability to blend reality with fiction, serious cultural analysis with madcap escapades, astonishing words with unforgettable images. In that spirit, and in proud partnership with the Thompson estate, Top Shelf Productions is pleased to announce Fear and Loathing in Las Vegas, a delightfully bonkers graphic novel by Eisner-nominated artist Troy Little adapting Thompson's book of the same name. "I'm so pleased that one of the first collaborative projects to come out of the Top Shelf / IDW relationship will be Troy Little's inspired take on a true classic of American literature," said Top Shelf Editor-In-Chief Chris Staros. "One of the most unforgettable writers turned loose in one of my favorite cities! We can't wait to show you what Troy's done with it." The much-beloved Fear and Loathing, subtitled "A Savage Journey to the Heart of the American Dream," follows Thompson analogue Raoul Duke on the mother of all Vegas benders, as he and his attorney Dr. Gonzo cover a motorcycle race, crash a drug-enforcement convention, and rack up obscenely large room-service bills, all while dosed to the gills on a truly spectacular assortment of mind-altering substances. Troy Little's faithful adaptation, scheduled for October 2015, will capture the full gonzo experience in a glorious full color graphic novel. Little is previously known for the Xeric-award-winning graphic novel Chiaroscuro and for his Eisner-nominated series Angora Napkin, both from IDW Publishing. Now, his irrepressibly energetic cartooning brings a new level of manic energy to Thompson's rocket-fueled narrative. "Buy the ticket, take the ride." Fear and Loathing in Las Vegas comes to a store near you this fall! MOTORCYCLE SAMURAI and TIM GINGER coming in July! Free Comic Book Day this weekend! After roaring success as a Top Shelf digital exclusive, Chris Sheridan is taking his over-the-top Mad-Max-meets-Kill-Bill thrillride to your bookshelf, with the print debut of The Motorcycle Samurai! This 176-page full-color graphic novel will hit stores in July. To celebrate, we're priming the pump with a FREE Motorcycle Samurai comic book, in comic shops everywhere this Saturday on Free Comic Book Day! Chris Sheridan himself will be signing copies and meeting fans all day at stores across Seattle - check his Twitter for details! We're delighted to introduce you to Julian Hanshaw, a thoughtful and witty cartoonist with a painter's eye and a poet's heart. His new graphic novel Tim Ginger, a character study of a widowed ex-test pilot, is full of rich desert colors, childless couples, haunting dreams, and exhausting conspiracy theorists. For fans of Jeff Lemire, Alex Robinson, or Eddie Campbell, don't miss Tim Ginger — click here for an interior glimpse, and pre-order today! Announcing Eddie Campbell's epic BACCHUS (Omnibus Edition), plus JOHNNY BOO MEETS DRAGON PUNCHER! The hits keep on coming! No sooner have we published the final chapter of the acclaimed League of Extraordinary Gentlemen: NEMO trilogy (Nemo: River of Ghosts) than it's time to announce two long-awaited Top Shelf releases — the gorgeous Omnibus Edition of Eddie Campbell's sprawling mythological epic Bacchus and the boundary-breaking crossover of James Kochalka's beloved series for kids, Johnny Boo Meets Dragon Puncher! The 560-page Volume One collects the first half of the Bacchus saga and will hit stores in JUNE! James Kochalka's totally-bonkers comics for kids recently earned him the Eisner Award (Best Publication for Early Readers)... now he's celebrating with the craziest concept yet — a crossover between his beloved Johnny Boo and Dragon Puncher series! When Johnny Boo Meets Dragon Puncher, the result is an explosion of adventure and fun. Click through for more details and sample pages, and pre-order now from your favorite retailer for release in JUNE! TODAY: Alan Moore & Kevin O’Neill present NEMO's final voyage down a RIVER OF GHOSTS! Alan Moore and Kevin O’Neill’s League of Extraordinary Gentlemen reaches a new milestone today, as Top Shelf Productions releases the grand finale of the Nemo spinoff trilogy, a pulse-pounding 56-page hardcover entitled River of Ghosts. In 2012, with the stunning conclusion of Century, the top-selling third volume of the League saga, creators Moore and O’Neill brought their literary-crossover saga to an incredible climax. Critics called it “magnificent,” a “glorious creative tapestry,” and “arguably one of the greatest comics of all time.” The authors might have been tempted to stop there and rest on their laurels... but one character, Captain Nemo’s steel-hearted daughter Janni, demanded the spotlight for herself, and a spinoff was born! With a classic two-fisted spirit of adventure, the NEMO graphic novels have followed the terrifying pirate queen in her confrontations with unearthly Antarctic horrors (in 2013's Heart of Ice) and mechanical metropolitan monstrosities (in 2014's The Roses of Berlin). Now, Top Shelf Productions and Knockabout Comics present what may be the Captain’s final voyage! It’s 1975, and our aging heroine is beginning to display a tenuous grip on reality. Pursuing shadows from her past—or her imagination—Captain Janni Nemo steers her wondrous ship Nautilus on an obsessive journey into the tropical mysteries of the Amazon, in a last attempt to put to rest the blood-drenched spectres of old. What awaits? New allies, outrageous enemies, inscrutable youths, impossible creatures, and a truly flabbergasting final battle. Don't miss Nemo: River of Ghosts — available today wherever books and comics are sold! Rep. John Lewis takes MARCH to The Daily Show! Last night, Congressman John Lewis continued his mission to share the legacy of the civil rights movement with today's youth, making his first appearance as a guest on The Daily Show with Jon Stewart. Lewis discussed his award-winning graphic novel series, March (co-written with Andrew Aydin and drawn by Nate Powell), which is swiftly becoming an essential resource for bringing the past alive to new generations and inspiring readers to carry on the powerful tradition of nonviolence. The next morning, Congressman Lewis continued the conversation and discussed March on CNN's New Day. March: Book One and the new March: Book Two, called "essential reading" by dozens of outlets including USA Today and The Washington Post, have spent a combined 50 weeks on the New York Times Best Seller List. Among other honors, March: Book One is a Coretta Scott King Honor Book, the freshman reading selection at several major universities, and the first graphic novel ever to receive a Robert F. Kennedy Book Award. A new book from Eisner Award winner Nate Powell? YOU DON'T SAY! Ever since he first joined Top Shelf with the 2006 autobiographical collection Please Release, Nate Powell has been one of the most fascinating cartoonists we've had the pleasure to publish. Longtime fans have joined us in watching his career unfold: winning the Eisner Award for Best Graphic Novel, speaking at the United Nations and on The Rachel Maddow Show, bringing the award-winning March saga to life, and much more. Now, following the release of the New York Times bestseller March: Book Two, Powell looks back on the past decade and has assembled a stunning collection of seventeen short works. Coming in May 2015 and open for pre-orders now, you mustn't miss You Don't Say. A celebrity glares. A community burns. A child’s heart breaks. A recipe summons a ghost. A dying woman makes her peace. An art form sustains the spirit. In You Don't Say, award-winning graphic novelist Nate Powell (Swallow Me Whole, March) collects a decade of powerful short works. Autobiography, fiction, essay comics, collaborations, and more fill these thoughtful, pitch-black pages, comprising rare and previously unreleased material from 2004-2013. Click here for an 8-page preview, and pre-order now with your favorite retailer for release in May! U.S. Congressman and civil rights icon John Lewis has brought his award-winning and best-selling graphic novel series March to the Bay Area this week, with a visit to Apple headquarters and speeches to thousands of students at San Francisco State University and San Francisco Public Library, as part of the launch tour for the new March: Book Two. Written by Lewis & Aydin and drawn by award-winning artist Nate Powell, March has become a cultural phenomenon, an instant #1 New York Times bestseller, and the first graphic novel to ever receive a Robert F. Kennedy Book Award. Today, as we head into the 50th anniversary of the landmark "Bloody Sunday" march in Selma that he led with Hosea Williams, the story of March is more essential than ever. It's fitting that, just as Lewis and his generation were inspired by the 1950s comic book "Martin Luther King and the Montgomery Story," Lewis is now performing the vital work of educating young people about the past and inspiring them to build the future — through the transformative power of nonviolence. GOD IS DISAPPOINTED IN YOU nominated for the Audie Award! Bring out the palms and break into psalms for Mark Russell and Shannon Wheeler, as the audiobook version of God Is Disappointed in You has been nominated for the Audie Award, often called "the Oscars of the audiobook industry"! Congratulations and best of luck to Mark, Shannon, and narrator James Urbaniak (The Venture Bros.) — with fellow nominees including Amy Poehler, Jim Gaffigan, and Dave Barry, it's fine company to be in. God Is Disappointed in You is the tongue-in-cheek "condensed" version of the Bible you never knew you needed -- hilariously modern, but surprisingly authentic -- written by Mark Russell and packed with cartoons by Eisner-award-winner Shannon Wheeler. After the smash-hit sellout of its first printing, it's been "resurrected" in a revised new printing and is now available in stores everywhere! John Lewis has been many things in his career: a civil rights activist, a featured speaker at the March on Washington, a leader of the "Bloody Sunday" march in Selma, a respected member of Congress, a recipient of the Medal of Freedom, and a worldwide symbol of the power of nonviolent protest. With his latest project, he's added "#1 bestselling author," as his multi-part graphic novel autobiography, March, has become a smash success. Today, the long-awaited March Book Two reaches store shelves, poised to be even bigger than its predecessor — and perhaps even more relevant to this day and age. With March: Book Two, Congressman Lewis, Andrew Aydin, and Nate Powell give us a first-hand experience of milestone events that transformed the nation, including the 1961 Freedom Rides and the 1963 March on Washington. At a time when, according to the Southern Poverty Law Center, the majority of states earn a D or F grade in teaching the Civil Rights Movement to their young people, March has quickly become a key resource for schools, libraries, activists, and the general reader. It’s been adopted in classrooms nationwide, spent 40 weeks on the New York Times Bestseller List, and even become the first graphic novel to win a Robert F. Kennedy Book Award. What's more, three major universities planned their freshman orientations around March, compelling 15,000 students nationwide to read and discuss it in a single month. Why a graphic novel? Because John Lewis remembers the impact that a 1957 comic book "Martin Luther King and the Montgomery Story" had on him and his whole generation, inspiring them to take up nonviolence and join the civil rights movement. Now he's having the same impact on young people today. As America continues to grapple with issues of race and the legacy of the civil rights movement, March offers an unforgettable success story and a way forward — one that's already been embraced by countless readers who are looking for hope today. Congressman John Lewis is an international icon, and his story is now more essential than ever. See why this project has become such a phenomenon — join the March! Alan Moore & Kevin O'Neill Voyage into the Unknown in NEMO: RIVER OF GHOSTS! SAN DIEGO, CA - Leading comic book and graphic novel publisher IDW Publishing announced today that it has acquired Top Shelf Productions, the award-winning independent publisher of graphic novels, including the #1 New York Times and Washington Post bestseller March by Congressman John Lewis, Andrew Aydin and Nate Powell, Alan Moore's League of Extraordinary Gentlemen (with Kevin O'Neill) and From Hell (with Eddie Campbell), Craig Thompson's Blankets, Nate Powell's Swallow Me Whole, and Jeff Lemire's Essex County. 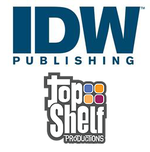 "The acquisition of Top Shelf is a milestone for IDW," said Ted Adams, IDW CEO and publisher. "We looked a very long time for a company that would complement our own publishing line-up, and in Top Shelf we found the ideal match. The addition of Top Shelf's library further positions IDW's leadership role among the top powerhouses in comics." Top Shelf will remain a distinct imprint within IDW and co-founder Chris Staros will join the company as Editor-in-Chief, Top Shelf Productions. Top Shelf's fans can expect the same independent editorial approach that has garnered industry-wide awards and made it an envy among its peers. "IDW is committed to preserving and growing the Top Shelf brand, which we've long admired," said IDW president and COO Greg Goldstein. "Chris and his team have built a great working relationship with creators, fans, and retailers alike, and IDW will work diligently to expand Top Shelf's publishing capabilities and market reach while further developing those relationships." Founded in 1997, Top Shelf Productions offers a broad library of comic books and graphic novels from dozens of the industry's top independent creators. Following the acquisition, Top Shelf's headquarters will remain in Marietta, GA.
"Top Shelf and IDW complement each other perfectly," said Top Shelf Productions co-founder and publisher Chris Staros. "We both started around the same time, and when I would watch IDW over the years, as a fellow publisher, I'd see them making smart move after smart move. Now I'm extremely excited to combine their talents and resources with Top Shelf's award-winning literary approach to comics. And believe it or not, the idea to join forces hit us both at exactly the same time. Last year, as I was about to pitch Ted and Greg this 'crazy' idea, they approached me to suggest the same thing! How's that for a good omen? Together, we're going to be able to publish some incredible work. I'm really looking forward to this." Save a Bundle on a Holiday Bundle, with Top Shelf's Seasonal Digital Sale! Top Shelf Seasonal Bundle (twenty of our all-time most beloved graphic novels, by the top names in the field) - $69.99! American Elf (the complete award-winning strip by James Kochalka, spanning 14 years of autobiographical magic) - $9.99! The Girlfriend Trilogy (Jeffrey Brown's landmark works of autobiographical intimacy) - $8.99! The Surrogates (the complete bestselling sci-fi series by Robert Venditti & Brett Weldele) - $5.99! Double Barrel (the complete digital magazine by Zander & Kevin Cannon, containing two full graphic novels and much more) - $5.99! Motorcycle Samurai (the acclaimed saga so far, by kinetic cartoon wizard Chris Sheridan) - $4.99! 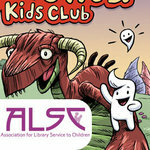 JOHNNY BOO and MONSTER ON THE HILL make ALSC's Graphic Novel Reading List! The Association of Library Service to Children (ALSC), a division of the American Library Association, today released the 2014 updates to their Graphic Novel Reading List, which aims to be a handy summary of the best graphic novels available for young readers each year. We're pleased to find two Top Shelf Kids Club titles receiving this honor: the Johnny Boo series by James Kochalka (for Grades K-2), and Monster on the Hill by Rob Harrell (for Grades 3-5)! Congratulations to James and Rob for this great recognition, and if you're looking to start or expand a collection of youth graphic novels, please take a look at the full ALSC list — as well as the full Top Shelf Kids Club line!